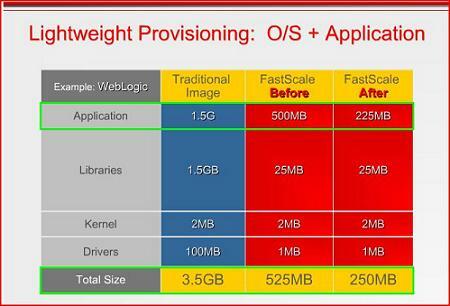 Fastscale is bringing its unique brand of software shrinking to Windows Server. The start-up this week unleashed - if you can use such a word for a company with 15 paying corporate customers - a shiny new version of Fastscale Composer Suite. Up to this point, the code has been locked down to Red Hat servers and applications, but it'll now stretch to Windows Server 2003 as well. In addition, the revamped suite adds some new application shrinking tools for corporate software. There's a good chance that you've never heard of Fastscale, and have no idea what it does. Here's the deal. Fastscale tries to route around bloated "golden images" - approved sets of operating systems and applications - by making sure that customers only load up the bits they really need for a given task. It keeps a repository of software on a DB2 database and then sends out thinned applications to servers as they're needed. You might, for example, have a 3GB install for an Apache on Red Hat web server. That's 1GB for the applications, 1.5GBs of libraries, 1-2MB for the kernel and 20-100MBs worth of drivers. In reality, you only need about 2MBs of OS and application code, along with 25MB of libraries, the kernel, and 1MB of drivers for a specific web server. So, Fastscale Computer Suite makes sure that a customer grabs that 30MB web server package rather than the whole shebang. Fastscale claims that its technology will let you do away with golden images altogether and add some speed and flexibility to your data center. Its software does make installing applications and then moving applications around different servers easier. With the latest release of Fastscale Composer Suite, customers can also fine-tune applications such as Oracle and WebLogic. To pull off this magic, administrators will tell Composer Suite some basic information about their applications. You might, for example, specify the JAR files being used on a given web site. "With that information, we can trace down and know exactly what the application will be doing. Then we set parameters around the max extent that the file can use of, say, WebLogic," said Richard Offer, VP of engineering at Fastscale. The Fastscale code may sound fanciful to some, but we hear it actually works and works well. In fact, VMware, according to our sources, stands as Fastscale's biggest customer, joining 14 others as paying enterprise types. For the last month or so, rumors have swirled that Sun Microsystems would like to purchase Fastscale, although no one is willing to comment on the record about such flirtations. "There is a lot of partnering going on these days, and we are always looking for the best opportunity to get our technology to more customers," said Fastscale chief Lynn LeBlanc. To get the suite up and running, you need a repository server, which is basically just an x86 box running Linux, DB2 and Fastscale's software. Pricing starts at $30,000. As mentioned, Windows Server 2003 is now supported along with Red Hat Enterprise Linux 4.6 and 5.2. Support for Solaris and Suse may arrive someday.